How does one save time getting ready in the morning? Monday through Friday I feel like I’m rushing in the morning to get everything done on time and out the door for the office. I’ve been driving to the same office for years, but the traffic has gotten worse. A couple of months ago I decided to reevaluate my morning routine and revise it to get things done early enough to make it to work on time. The answer is to plan ahead, prepare, prepare, and prepare some more. The first thing I decided to do was to pick out my outfit the night before. I could easily waste 10 to 15 minutes standing in my closet in the morning, tired and indecisive. Sad as that is, it’s the truth. (My husband is a witness, and has been known to ask me “what are you doing in there?” on many occasions.) No more standing around and lollygagging for this girl because my clothes are ready to go before I am. Another life changer is making my meals the night before. I bring a lot of little meals to work so it’s quite a chore to gather all of my food together. This one definitely doesn’t take any less time the night before like the clothing does, but I’m not doing it in the morning, and that’s actually enough. Sticking with today’s theme of preparing things ahead of time, this salad is a great one to make ahead of time. In fact, this is a great Sunday meal prep for several lunches at once. I make a bunch of rice and portion out all of the ingredients into separate containers. I get to do all the work once and get a bunch of meals out of it so this one really genuinely saves time. Nifty, right? I know that some people are not a fan of tuna. Or maybe you’re like me and have to be in the mood for it. This salad is super versatile and it’s a great base to create your own variation. 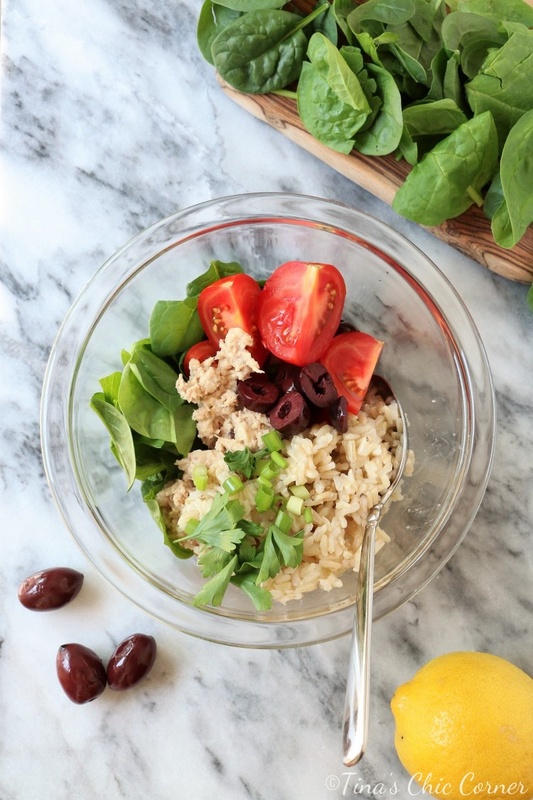 Feel free to swap the tuna for another healthy protein, like salmon, grilled chicken or chick peas to have an equally delicious meal (it just won’t be called tuna and rice salad any more, but that’s on you 😉 ). What is your morning routine and do you have any tips for saving time? Cook the brown rice according to the directions on the box. 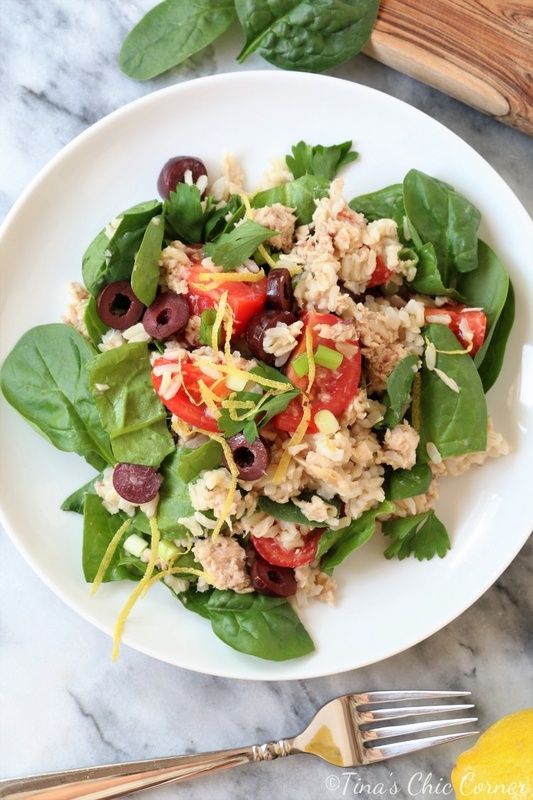 Place the cooked rice, spinach leaves, tuna, sliced spring onion, quartered tomatoes, sliced olives, lemon zest, lemon juice, and fresh parsley in a bowl and mix everything together. 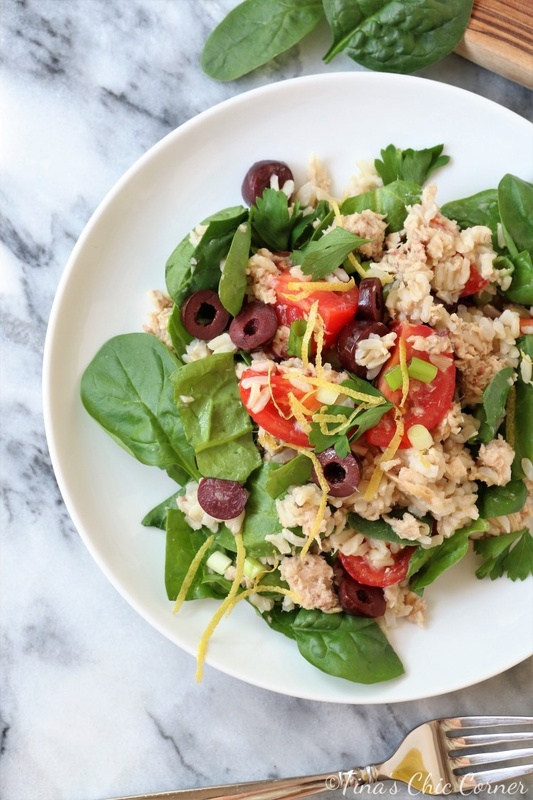 This tuna and rice salad is so colorful! My morning routine isn’t something to be proud of cause I barely have time to eat at all (even when the food is all ready to be eaten), wish I had some tips for you 🙁 But anyways, at least I have some time to cook at night and this salad looks great!